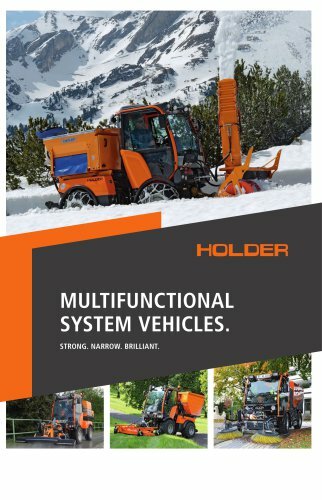 Catalogs > MAX HOLDER GMBH > MULTIFUNCTIONAL SYSTEM VEHICLES. MULTIFUNCTIONAL SYSTEM VEHICLES. STRONG. NARROW. BRILLIANT. THE STRONGER, THE HOLDER. Holder system vehicles are found especially where demands on man and machine are particularly high. The reason: Our multifunctional implement carriers are designed for all-year round use in the toughest conditions. Together with perfectly matched attachments the vehicles provide a total package technically and economically outpacing standard solutions. See for yourself.